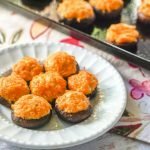 These buffalo chicken low carb stuffed mushrooms make for a delicious low carb or keto appetizer for your next holiday or football party. You can even at these as a low carb snack or meal! Five stuffed mushrooms only have 3g net carbs! Take out the stems and scoop out a little out of the middle of the mushrooms.Lay upside down on a sprayed cookie sheet and bake for 15 minutes. In the meantime make your buffalo chicken mixture. Mix together 3/4cup of the cheddar cheese, cream cheese, mayo, garlic, cooked chicken and buffalo sauce. When the mushrooms are cooked and cooled, fill with the buffalo chicken mixture and top with the remaining cheddar cheese. Place on a sprayed cookie sheet and cook for about 15- 20 minutes or the cheese is melted.